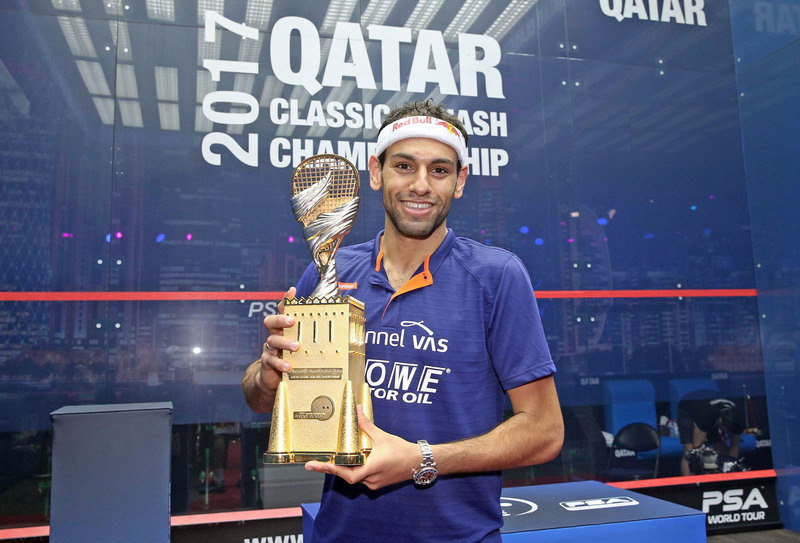 Egypt's Mohamed ElShorbagy won the Qatar Classic - PSA World Series tournament - for the third time in his career courtesy of a 3-1 win over compatriot and surprise 2017 finalist Tarek Momen inside Doha's Khalifa International Tennis and Squash Complex earlier today. Competing in his sixth straight Qatar final the 26-year-old from Alexandria showed his championship calibre throughout the event as he swept past World No.8 Fares Dessouky, World No.4 Ali Farag and World No.1 Gregory Gaultier to reach the title-decider - where his big game experience was too much for debutant finalist Momen, the World No.7. It was ElShorbagy who took the opening game as Momen, competing on the biggest stage of his career, showed signs of nerves and while the 29-year-old showed his mettle to take the second game he was ultimately a step behind ElShorbagy in the end as the former World No.1 prevailed 11-8, 10-12, 11-7, 11-7 to add the 2017 title to his wins in 2013 and 2015. 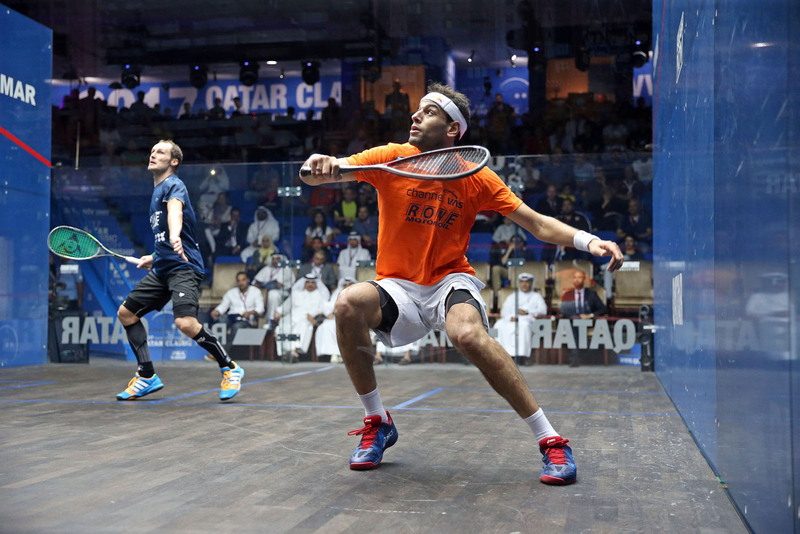 "I'm extremely proud of how I performed this week at this event," said ElShorbagy. "When I saw the draw pre-event I knew it would be tough. I had to play the World No.9, the No.5, the No.1 and the No.7 to win, but playing tough opponents is the challenge that I live for. To be the best you have to beat these players. "At the end of the day you want to challenge yourself against the best. Backing it up mentally each day was not easy - but I'm really happy. Last season I didn't play like a winner - this week I feel like I played at my best level and that was my focus coming here." After dropping the second game ElShorbagy looked to be up against it in the third as Momen, utilising his speed and agility, attacked in the mid-stages to string together a series of punishing rallies and sap energy from ElShorbagy's legs. But the Bristol-based player showed just why he has won 28 PSA World Tour titles - 14 of which have come at World Series level - as he dug in with dogged determination to come through a crucial stage of the match and complete the win. 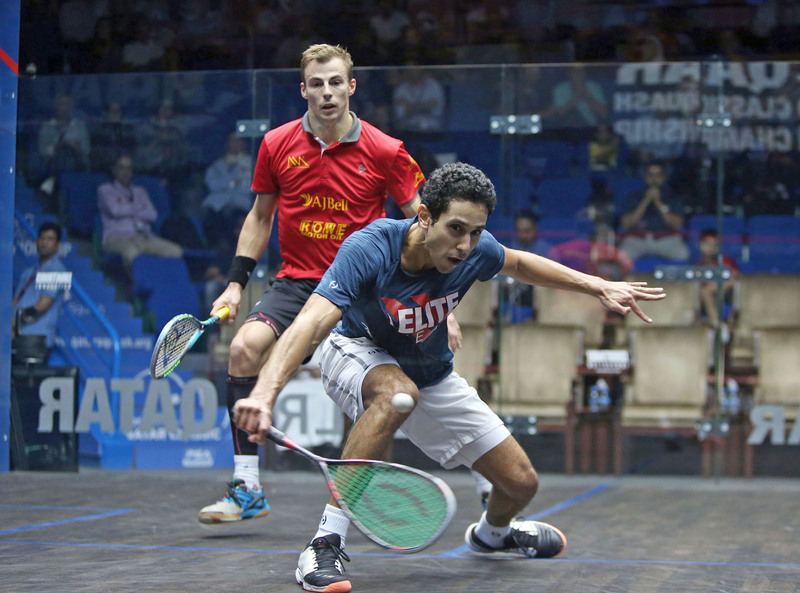 "This week I got it right and I felt I played the big points well," said ElShorbagy. "What made the difference today was my experience. I have been in so many finals. But it was his first. I knew the emotions he was going through. "I was trying to contain him but at times he was like a train - I just couldn’t stop him. When he took the second game it was a big blow for me. He really pushed me and I feel this is jus the beginning for him. If he can keep that momentum, he’ll be hard to stop. "But today it didn’t matter how tired I was - it was about how much I wanted to win. I just killed myself on every shot and I'm so happy to have won." After the match Momen said: "It's been an incredible week for me. I didn't know what to expect coming here and making my first ever World Series tournament final was very special. Obviously I'm disappointed to lose but think it was a good match." 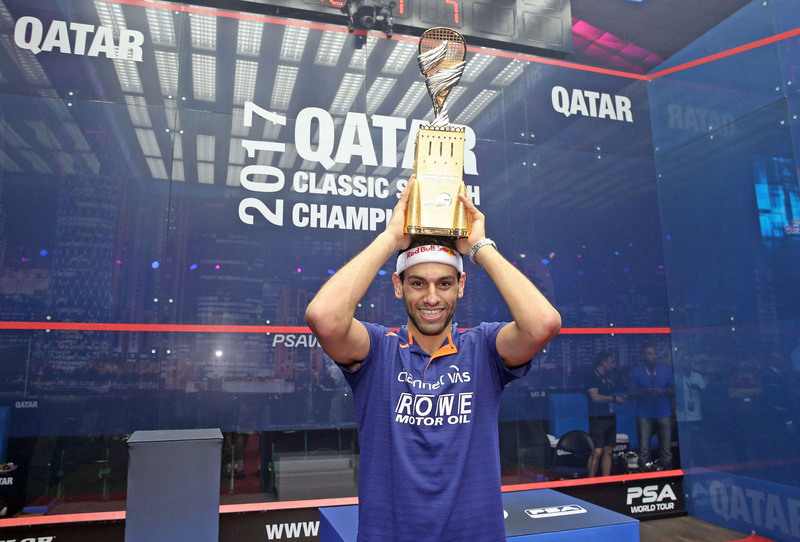 World No.3 Mohamed ElShorbagy will appear in the final of the Qatar Classic for a fourth consecutive year - where he will be aiming to win the title for a third time - after he defeated World No.1 Gregory Gaultier in the semi-finals of the 2017 iteration of the event to set up an all-Egyptian clash with Tarek Momen, who will appear in the first World Series final of his career. ElShorbagy, who lost to Karim Abdel Gawad twelve months ago, and Gaultier were meeting for the 21st time in what is one of the fiercest rivalries of the modern era but, after coming through a spell-binding opening game, it was the 26-year-old from Alexandria who prevailed at the Khalifa International Tennis and Squash Complex to end the Frenchman’s 30-match unbeaten run over a best-of-five games format. 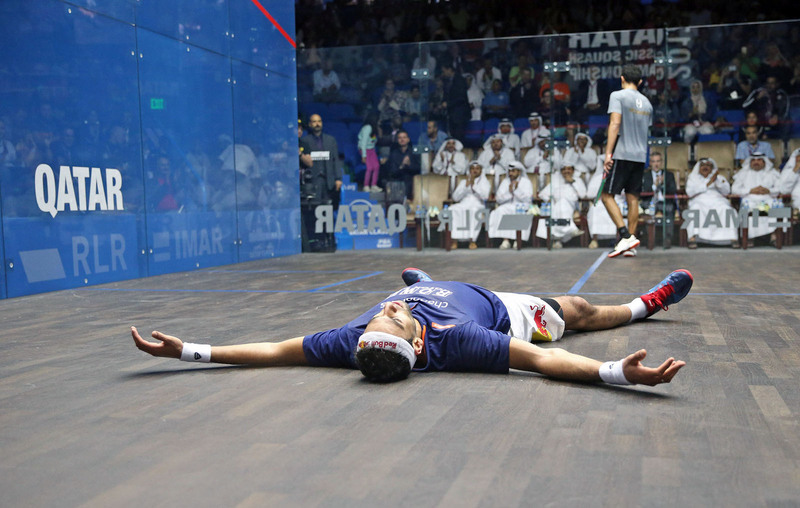 Buoyed on by a partizan crowd ElShorbagy - who showed little tiredness after a brutal five-game clash with Ali Farag the day before – attacked with intensity from the off to avenge his defeat to Gaultier at the Tournament of Champions in New York in January. “I’m really happy to be back in the final here, it’s where I won my first ever World Series and to be back in my fourth consecutive final is an honour,” said ElShorbagy. "He made a fool of me in that match in New York and I thought about it all summer - it motivated me to get back to my best in the off season and I really wanted to go out there today and beat him 3-0. “Without the way that he beat me at the ToC that day, I wouldn't be as hungry as I am now. I had a bad season by my standard last year but I feel like I'm better every tournament and every match this season so far and I'm really pleased to be competing for the title here once again." Meanwhile Momen, three years ElShorbagy's elder at 29, secured a long awaited debut in a major PSA World Series tournament final courtesy of a dominant and controlling straight-games victory over Germany's Simon Rösner - who was himself competing in just his first ever World Series semi-final. It what was the sixth meeting between the pair it was Momen who kept his nerve on the big stage, coming out firing in the early stages to pile the pressure on the big German, profiting from a series of unforced errors to take the opening game and set up the foundations for an 11-9, 11-5, 11-7 victory. “I’m really happy, I can’t believe I’m in my first World Series final – it’s amazing," he said afterwards. "I really wanted to win. It's been long over due for me. I've been waiting to get to the finals of a major event for a long time. I saw the opportunity today and wanted to make the most of it. "I think I had a physiological edge - with the crowd supporting me and having been in a semi-final before - and I took advantage of it. Earlier this season I wasn't in the zone mentally but I knew I wasn't far off and finally it materialised this week and I'm so happy. "I've had some huge matches against Mohamed before and I have won against him as well so I know nothing is off the table. I'm in the final and I'll give it my all and continue to believe in myself." 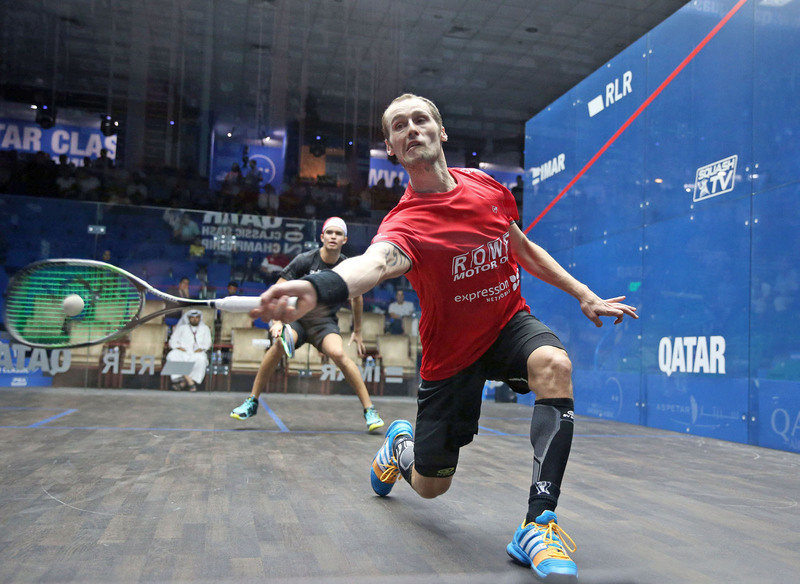 Germany's Simon Rösner will compete in the semi-finals of a major PSA World Series tournament for the first time in his 14-year-career after defeating World No.6 Marwan ElShorbagy courtesy of a highly impressive display in the quarter-finals of the 2017 Qatar Classic - the second PSA World Series tournament of the 2017/18 season. Inside the Khalifa International Tennis and Squash Complex in Doha the World No.12, competing in his 21st World Series quarter-final, followed up his superb last sixteen win over World Champion Karim Abdel Gawad with a highly polished display that saw him dominate ElShorbagy in the third and fourth games and take an 11-7, 9-11, 11-5, 11-3 victory to seal a maiden last four appearance. “This is the biggest win of my career - it has to be the biggest achievement of my life,” said a delighted Rösner afterwards. “Even though I beat Karim last night, getting to the semis is the most special thing for me because I haven’t been able to reach this stage at this kind of tournament. "To reach this stage after so many years is a great feeling, and I’m turning 30 on Sunday, so it’s just before my birthday. I think this is already a good birthday gift but the tournament is not over yet, if I play like I have done the past two days then I can get even further. “I’m feeling comfortable here, I’m playing well and feeling good, I’m confident that I can beat these guys and I think that made a difference today." Rösner will go up against World No.7 Tarek Momen for a place in the finale after the Egyptian 'Viper' knocked out 37-year-old Nick Matthew of England in four games to secure his first World Series semi-final berth in three years - taking advantage of an uncharacteristically error-strewn performance from Matthew. "I’m very happy that I managed to get the win," said Momen. "I’m expecting a huge battle [against Rösner], I can’t believe we’re both playing in the semi-finals tomorrow. Simon has been trying to get to this stage for a long time and I’m happy for him because he has been working so hard and he has been very unfortunate a few times. "For me, it’s back to the semi-finals after a three-year drought. The last one I was in was in Hong Kong and I beat Simon to get there, so I’m hoping for a good win tomorrow and maybe I’ll get through to my first ever World Series final." 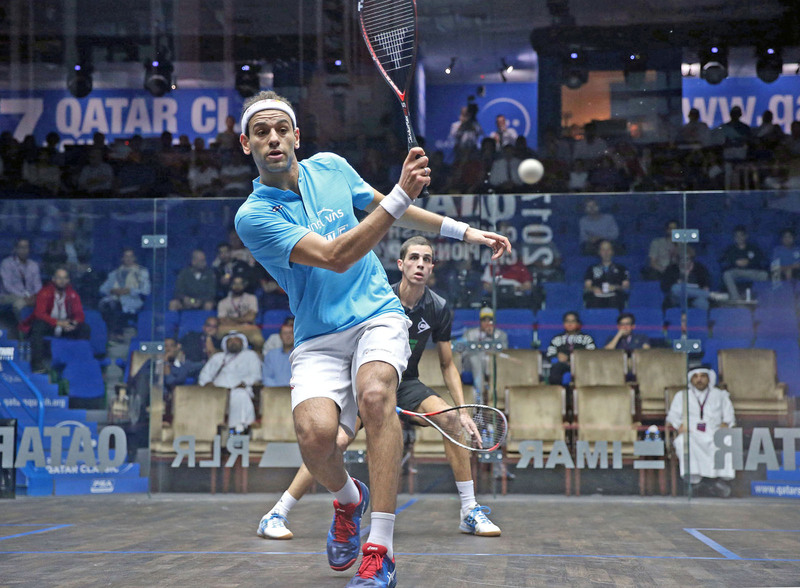 Meanwhile the top half of the draw saw the latest instalment of the rapidly developing rivalry between Egyptian stars Mohamed ElShorbagy and Ali Farag go the way of World No.3 ElShorbagy - as he withstood a late fight back from Farag in what was yet another superb clash between the two. 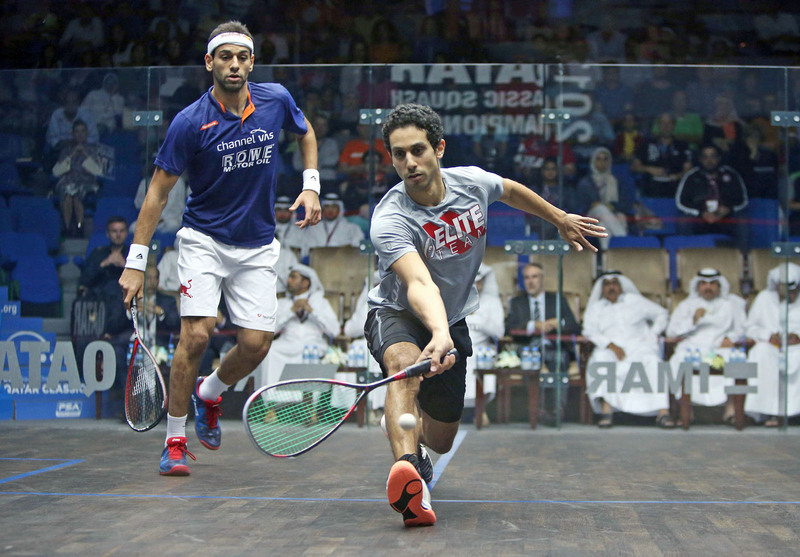 The two Egyptians were meeting for the third tournament in succession and had shared the spoils in their last two meetings, with Farag overcoming ElShorbagy in last month’s U.S. Open final, while ElShorbagy avenged that defeat with victory in the Channel VAS Championships a week later. But this time around it was ElShorbagy, a two-time winner and last year’s tournament runner-up, who prevailed 11-7, 11-4, 9-11, 16-18, 11-8 in a mammoth 93 minute encounter. 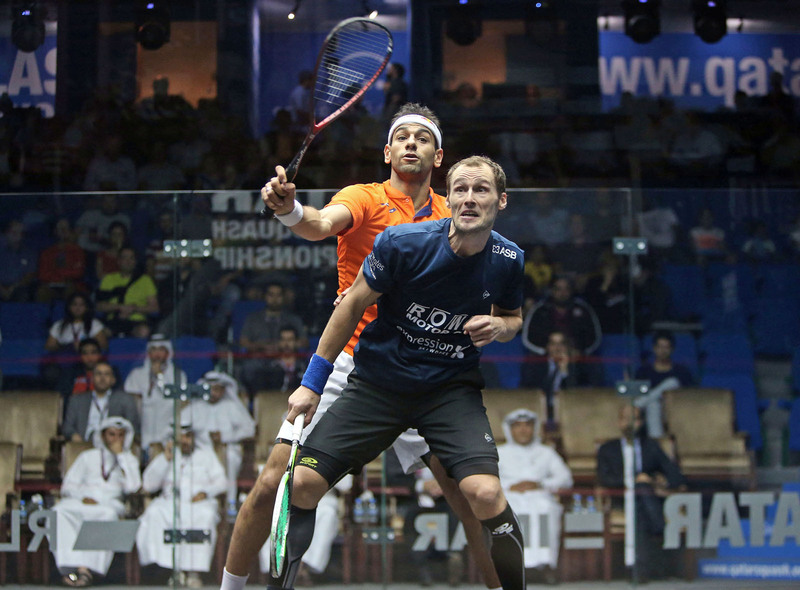 “He’s making me push that extra mile every time we play," said ElShorbagy. "We’re going to push each other for the rest of our careers because we always play such great matches together. “I’m really happy I got through, it was 50-50 and I’m happy I got the win in the end. I’m not going to be able to beat him every time, that’s just how it is and that’s the beauty of the sport. ElShorbagy will face World No.1 Gregory Gaultier in the last four after the Frenchman defeated young Peruvian Diego Elias in straight games. 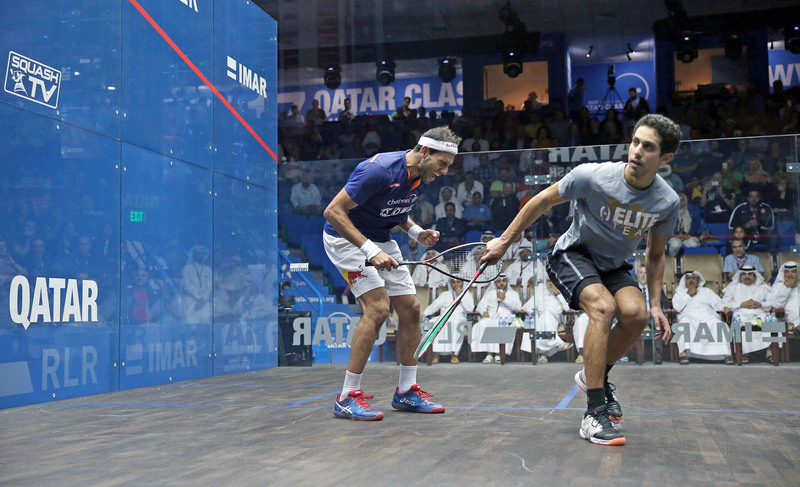 Squash World Champion and 2016 title winner Karim Abdel Gawad crashed out of the 2017 Qatar Classic after suffering a surprise second round defeat at the hands of German Simon Rösner, the 29-year-old from Paderborn who out-hustled and outplayed the former World No.1 inside Doha's Khalifa International Tennis and Squash Complex. Gawad, who beat compatriot Mohamed ElShorbagy in the title decoder here twelve months ago, was off the pace in the early exchanges as Rösner attacked at will to take the first two games and establish a commanding scoreboard lead. And the World No.12 then showed impressive mental composure to withstand a huge onslaught from Gawad, recovering from dropping the third game, to come through 11-7, 11-8, 3-11, 11-9 and seal a significant win that sees him record his first victory over a top four player at a major PSA World Series event. "I had to be like a man possessed to come through today," said Rösner. "The key was keeping my focus at all times. Even when I was up 2-0, I didn’t panic or get excited. "I've struggled to get these big wins against top four guys in the past so I'm really happy that I was able to actually play the way I know I can and keep my head throughout. "You just need that one win against these kind of players to boost that belief in yourself. It was a big thing in my head so I'm delighted with how I performed today." Rösner will now face another Egyptian, Marwan ElShorbay, for a place in the semi-finals in the bottom half of a draw that will also see Tarek Momen and 37-year-old Nick Matthew face-off. The Englishman, up against one of the best movers in the game in the form of Mathieu Castagnet, ensured his last eight spot courtesy of a masterclass performance that saw him display patient, persistent squash of the highest order to come from behind in the opening two games and break the spirit of the Frenchman and complete the win. "Psychologically the second game was massive today," said Matthew. "He's a fighter, he's strong physically and mentally, so I knew the points wouldn't come quick. I was behind and I had to use my experience to come through. I got my game plan right." Elsewhere, the top half of the draw will see two-time tournament champion Mohamed ElShorbagy face Ali Farag for the third time in three events. The duo squared off in the finals of both the U.S. Open and Channel VAS Championships - with each man claiming one win apiece so far this season - as their on court rivalry continues to intensify. 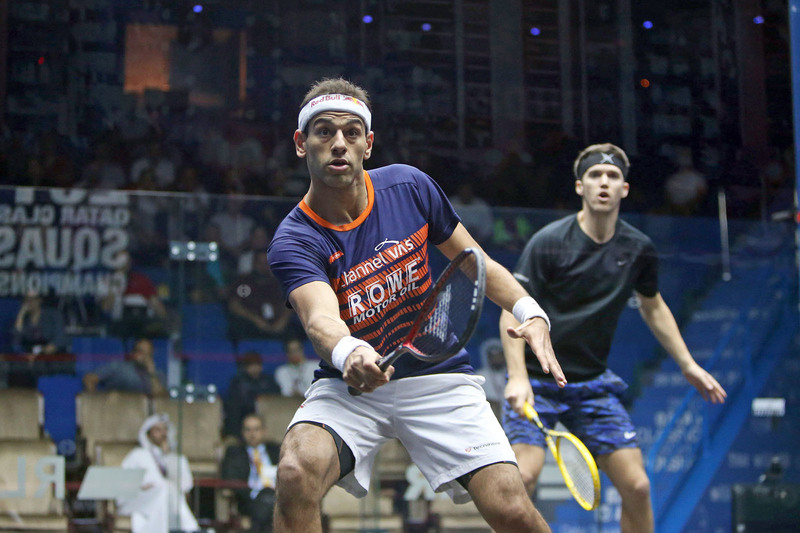 "I can't get away from Ali at the moment," said ElShorbagy after his victory over Fares Dessouky. "We played the last two finals in a row and we've had two great battle so I'm sure it will be the same again tomorrow." World No.1 Gregory Gaultier will face rising Peruvian star Diego Elias in the final quarter-final match. 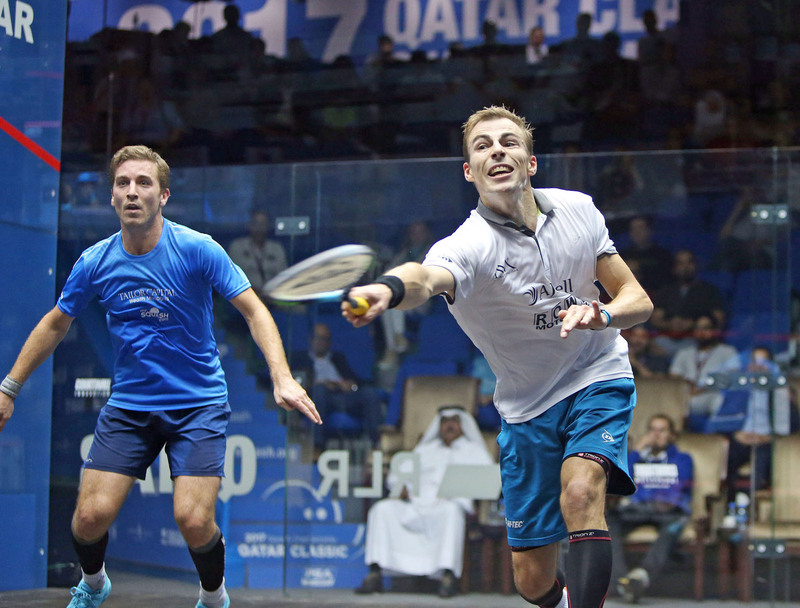 Three-time World Champion Nick Matthew was forced to call upon all his experience to avoid a shock defeat against un-fancied German Raphael Kandra in the first round of the 2017 Qatar Classic – the second PSA World Series event of the 2017/18 season. The 37-year-old, competing in his 20th and final season on the PSA World Tour, looked to be in cruise control early on against the World No.42 as he took the first two games to establish a commanding lead. But Kandra, ten years Mathew’s junior, was equal to the challenge, winning the next two games to set up a compelling fifth during which he matched Matthew all the way to 8-8. With an early exit looming however Matthew managed to find just enough to escape, sealing the 12-10, 11-9, 5-11, 8-11, 11-8 that takes him through to face Frenchman Mathieu Castagnet – who defeated Scotsman Alan Clyne – in the second round. “I was hitting hard and running with him early on which was silly because he’s much younger than me,” said Matthew. “But finally at the end I started to use my brain and my experience – which shows you it’s never too late. He was sharper than me today but it was experience that saw me through. 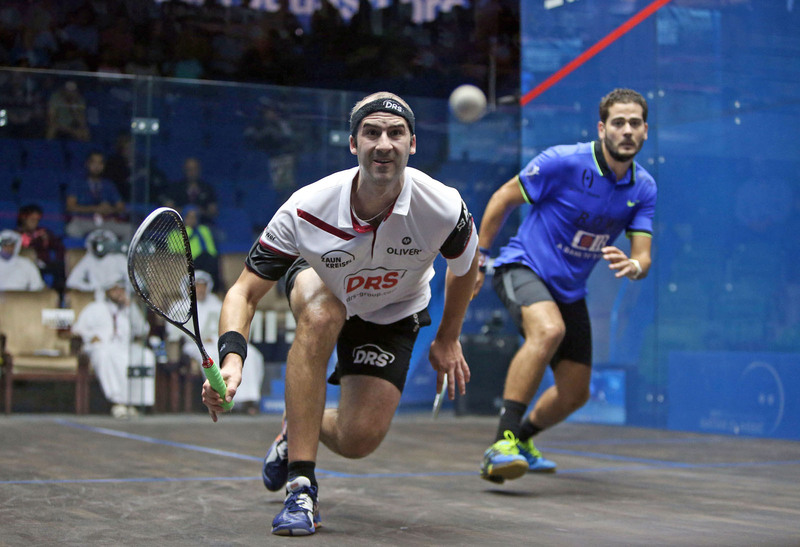 Matthew’s victory was just one of eight on a day of marathon encounters at the Khalifa International Tennis and Squash Complex which was highlighted by Omar Mosaad’s thrilling and gruelling 108-minute victory over Colombia’s Miguel Angel Rodriguez. The opening game alone lasted 28 minutes and set up what was to follow as the duo traded blows back and forth all the way until a fifth game tie-break that saw both squander match ball opportunities before Mosaad, a former World No.3 who slipped outside the top 30 this year, forced the error that secured his place to take on compatriot Marwan ElShorbagy for a place in the quarter-finals. “You always know against him that it will be physical and that you need to stick to your plan,” said Mosaad. 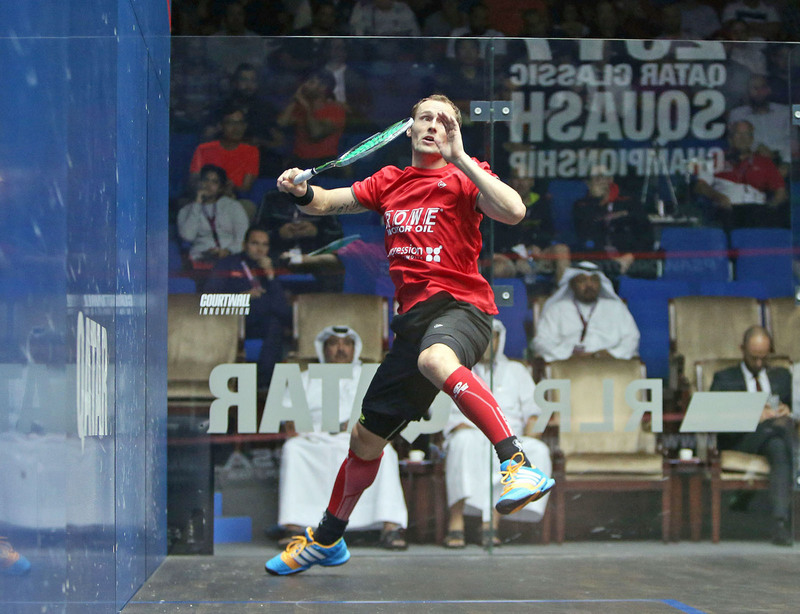 “I had a good result at the last event I played and it’s important to try and stay in that zone and keep consistent. I’m trying to get back up the rankings and I need to win more matches to get back on track. Defending champion Karim Abdel Gawad also came through a tough 62 minute encounter with Spaniard Borja Golan to keep his defence alive, surviving a huge fourth game tie-break to see out the win. “Today I wasn’t at my best but you aren’t always at your best and in those days you have to find a way to win and get to the next round,” said Gawad. The other winners on day two of action were Germany’s Simon Rösner, Australian Cameron Pilley and Egyptians Marwan ElShorbagy and Tarek Momen. 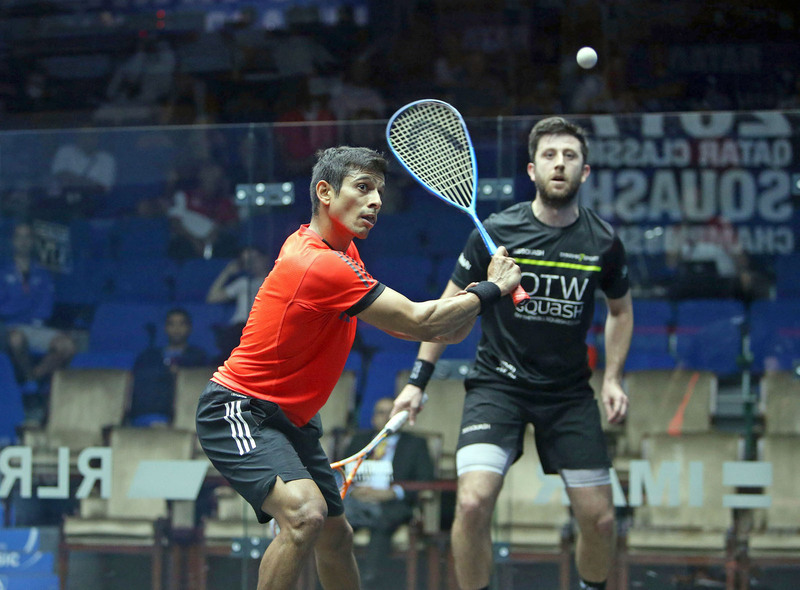 Peru's Diego Elias continued his fine start to the 2017/18 PSA World Tour season with an against-the-seedings first round victory over former World No.1 James Willstrop at the 2017 Qatar Classic - producing a highly impressive and dominant performance to win in straight-games at the PSA World Series tournament taking place in Doha. 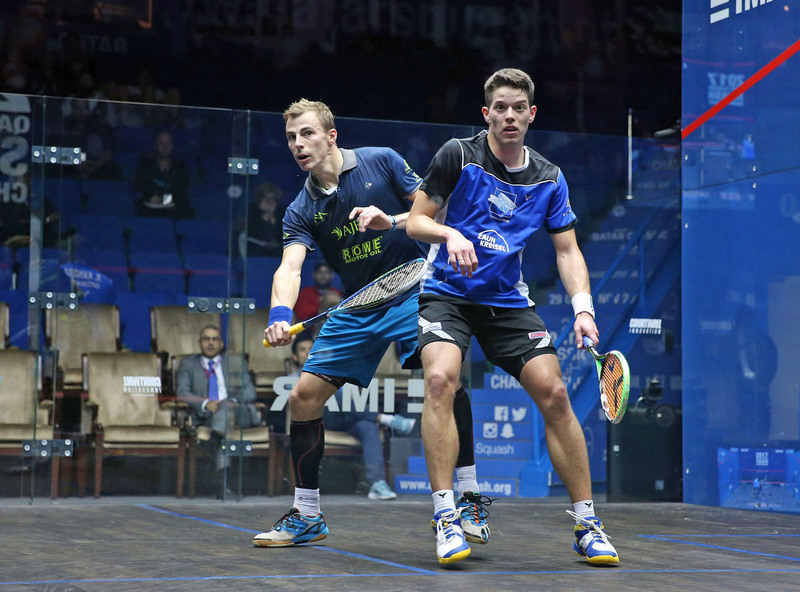 The 20-year-old - who began his season with victory over three-time World Champion Nick Matthew at the NetSuite Open in September - showed impressive maturity and composure as he came from behind in the opening game to counter Willstrop's trademark accuracy and set up the foundations for the 3-0 win that cements his graduation from prodigal talent to genuine top calibre contender on the PSA World Tour. "Last time we played it was about a year ago and he played so well that day that I couldn’t do anything," said Elias. "It’s always hard to play against a player like him so today I just tried to apply as much pressure as I could throughout the match and keep my concentration levels high. "The first game was crucial. I think I was down 8-3 and I just tried to change things up and move him around the court. I feel confident on court and feel like my game is coming together well so I hope this can be a good tournament for me." Elias will now go up against Saurav Ghosal for a place in the quarter-finals after the Indian number one secured his own upset against England's number three Daryl Selby. Ghosal, who fell as low as No.30 on the rankings earlier this year following a poor run of form, oozed confidence as he dominated on court against Selby from the outset. The 31-year-old used his pace and movement to expose Selby and looked like a player renewed as he saw out the match 3-0 to record his first ever win over the World No.15 and also secure his berth in the second round of the event for the first time in his career. "I had a good week last week in St George (PSA M100 event) and had a decent start to the season in Macau too - so I'm just trying to enjoy my squash as much as I possibly can," said Ghosal. "I'm enjoying playing and feeling privileged to be competing at great events such as this in Qatar. I'm trying to do the things I know I'm capable of - things which in the past I haven't executed as well as I should have. "If I can enjoy it for the most part then I feel I can give a good account of myself." Hong Kong's Leo Au was another surprise winner on the opening day of action as he recorded a 3-1 win over Australia's Ryan Cuskelly while World No.1 Gregory Gaultier marked his return from injury with a comfortable 3-0 win over Mexico's Cesar Salazar. "It's been tough recently with the ankle injury so I came here just happy to be back on court," said Gaultier. "Cesar has been playing well and had some good wins recently so I'm just pleased to come through." Two-time tournament winner Mohamed ElShorbagy was amongst the other winners on the day alongside compatriots Fares Dessouky, Zahed Mohamed and Ali Farag. 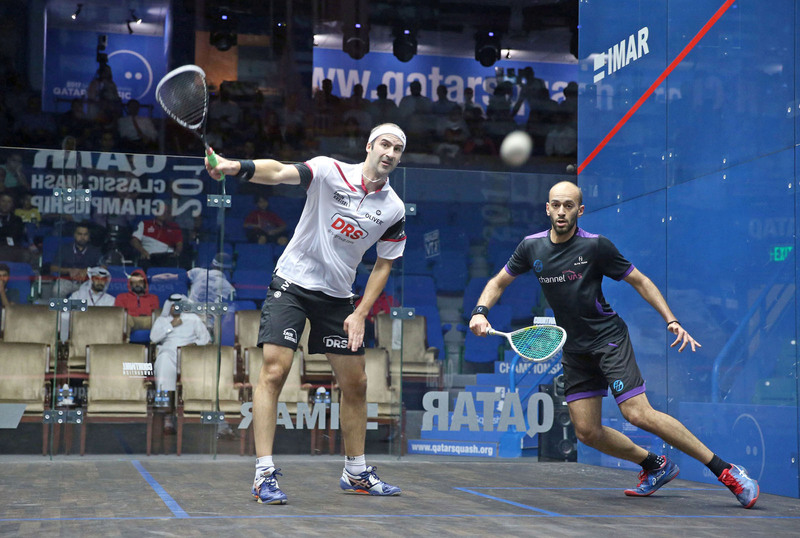 England’s Adrian Waller and Germany’s Raphael Kandra produced the only upsets of the day as they overcame the seedings to down Omar Abdel Meguid and Nicolas Mueller, respectively, to secure their place in the first round of the 2017 Qatar Classic – the second PSA World Series event of the 2017/18 season. Up against the number three seed Meguid, Waller showed impressive composure to come through a crucial third game tie-break that set him up for the 3-1 win and he will face Australian Cameron Pilley in the main draw. Sandra meanwhile was equally impressive as he twice withstood an onslaught from Mueller to come through a tough five-game affair and earn a place against England’s Nick Matthew – the three-time World Champion who’ll be making his last appearance at the Qatar event this week. Elsewhere there were wins for Hong Kong duo Tsz Fung Yip and Leo Au with Scotland’s Alan Clyne England’s Chris Simpson and Indian Saurav Ghosal completing the line up of qualifiers. 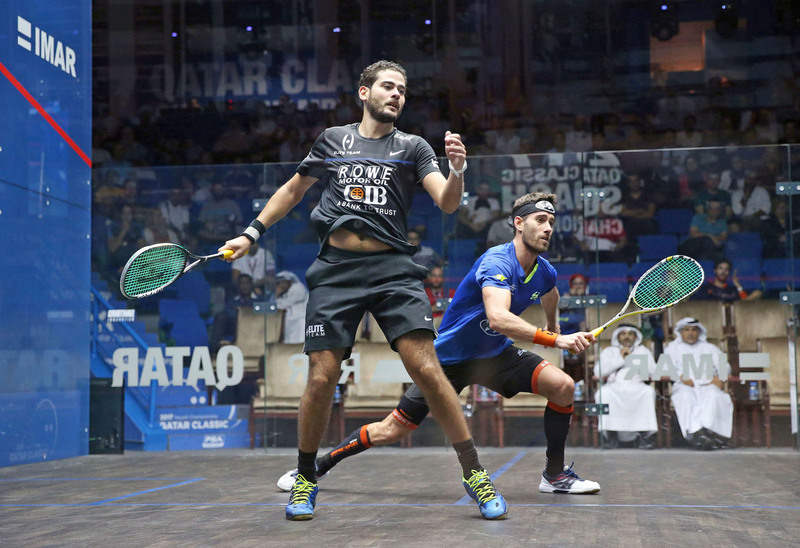 Qualifying for the Qatar Classic 2017, the second PSA World Series event of the season, got under way at the Khalifa International Tennis and Squash Complex in Doha with sixteen first round qualifying matches. Eight of the matches featured Qatari players, but none were able to to capture the win required to have a chance of joining wildcard Abdulla Al Tamimi in the $165k main draw. The day started with two “local derbies” as Malaysia’s Eain Yow Ng and Ivan Yuen locked horns for the second time in a week, youngster Ng coming away with another upset win as he won 11/9 in the fifth in 79 minutes, the longest match of the day by some margin. Charles Sharpes also upset the seedings as he beat compatriot Tom Richards in three close games, one of five Englishmen to advance to tomorrow’s qualifying finals, Richie Fallows joining Sharpes in upsetting the seedings with a four game win over Mohamed Reda. A fourth upset result came in the final match of the day in which Kuwait’s Ammar Altamimi won three close games against Pakistan’s Farhan Mehboob. Qualifying Finals start at 14.00 on Saturday, again on the all-Glass Court and the traditional Court One. 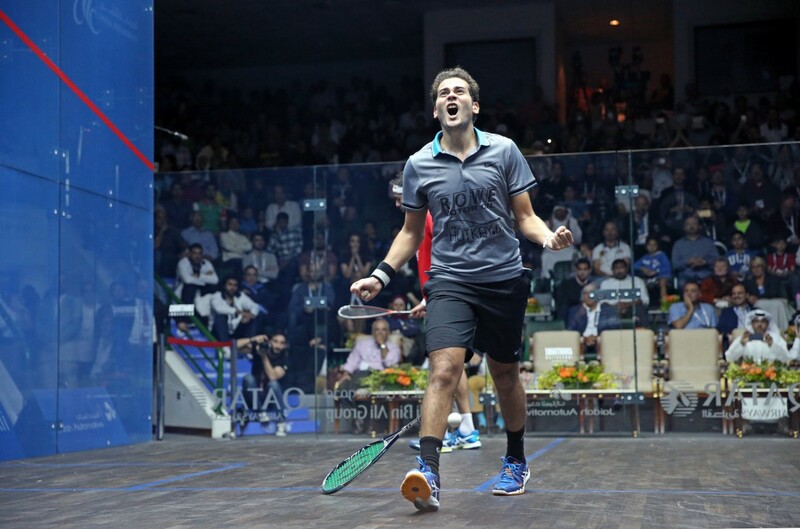 World Champion Karim Abdel Gawad says that he aiming to come back stronger after a mixed start to the 2017/18 season when he returns to the Khalifa International Tennis and Squash Complex between October 29 - November 3 to defend his Qatar Classic, World Series title in Doha. 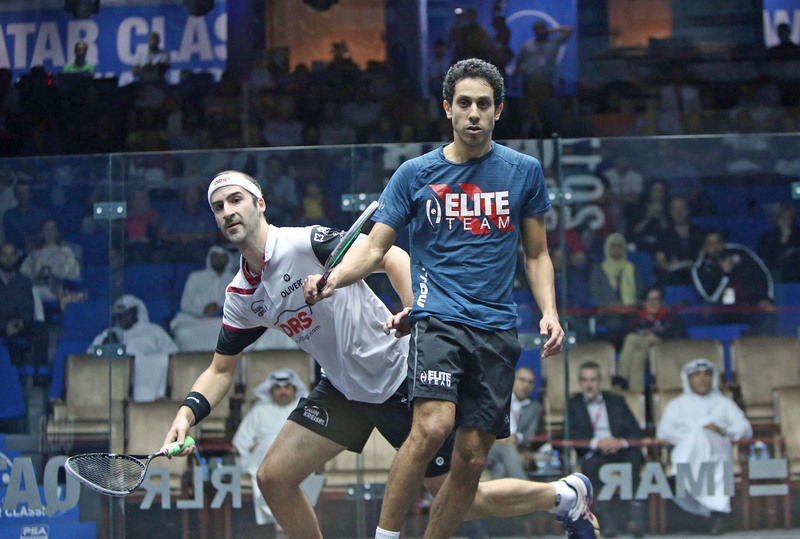 November 2016 was one of the most remarkable months of Gawad’s career as he became the third Egyptian to lift the PSA Men’s World Championship title, while he followed that up two weeks later with his first ever World Series title at the Qatar Classic, defeating compatriot and the World No.1 at the time, Mohamed ElShorbagy. It was a landmark moment for the current World No.2, who had only ever reached a solitary World Series final before his displays in Doha, and Gawad admits it was one of the most enjoyable wins of his career. "It was a very special moment for me as it was my first ever World Series win and I really enjoyed the way I was playing at that moment, I was enjoying every second on court," said Gawad. "November was a very special month for me, winning the World Championship and my first ever World Series event was just too much to ask for. "Maybe most people thought I would feel a lot of pressure playing Qatar after the World Championships, but for me it was the opposite. I had zero pressure because I thought my body and mentality wouldn’t handle another big tournament, with lots of tough matches just a few days after winning the biggest tournament of the year. "All I wished for is to enjoy my game and I tried to win as many matches as possible. Suddenly, I found myself feeling stronger physically and I was still hungry for another win, so it went from there." 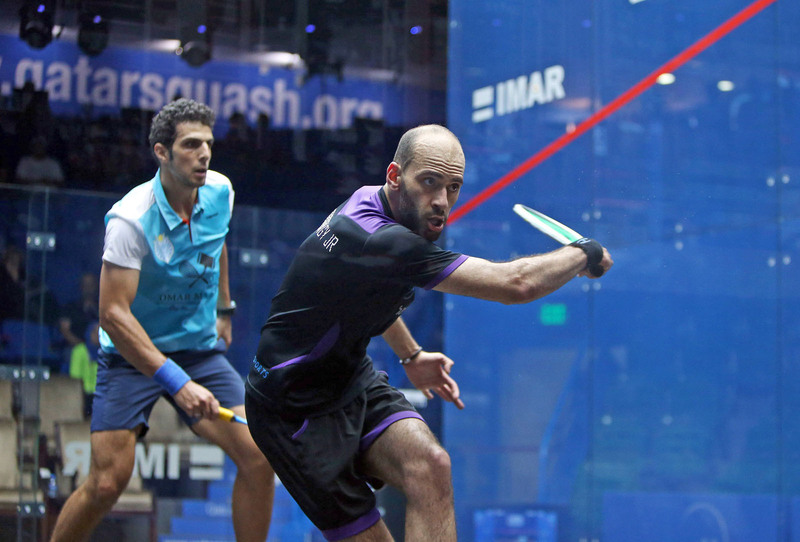 Gawad has had an up-and-down beginning to the new season, with a runner-up finish to ElShorbagy at the Oracle NetSuite Open last month followed by a shock first round defeat at the hands of World No.10 Paul Coll at the U.S. Open. The 26-year-old from Giza is determined to put that defeat behind him though as he targets a third successive World Series title to go with his triumph in Qatar last year and the J.P. Morgan Tournament of Champions crown he picked up in January inside New York’s stunning Grand Central Terminal. "I know I didn't perform my best, I know losing in the first round is not what I am supposed to do. "That will make me learn from it and come back as strong as I can." 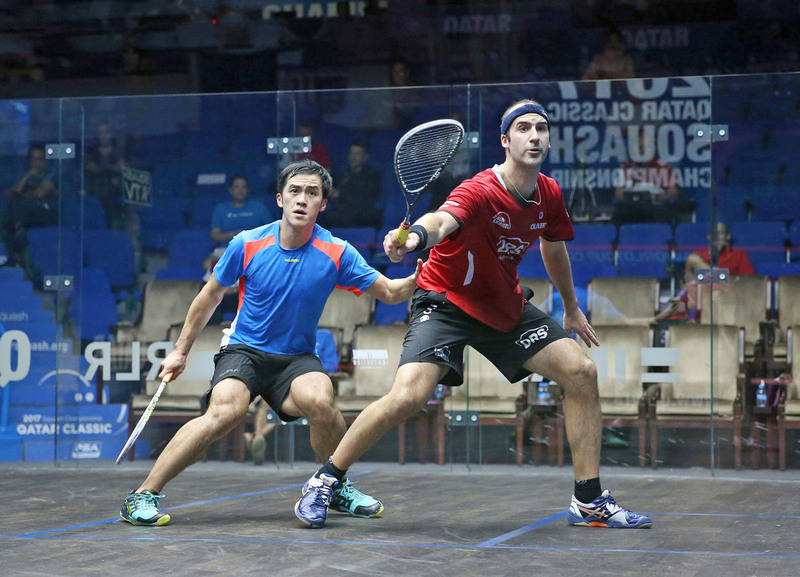 Second seed Gawad has a tricky first round tie against Spain’s former World No.5 Borja Golan in store, with Golan getting the better of Gawad in their Windy City Open quarter-final clash in February. Gregory Gaultier tops the draw as he makes his first appearance of the season after sitting out the early weeks with an ankle injury, while last year’s runner-up Mohamed ElShorbagy is seeded to meet the Frenchman in the semi-finals. 2009 winner Nick Matthew is on Gawad’s side of the draw and is making his last ever appearance at the tournament after last month’s announcement that the Yorkshireman will be retiring at the end of the season. Qatar is represented by a number of players in the qualification stages, while Abdulla Mohd Al Tamimi, the World No.37, represents local hopes in the main draw. 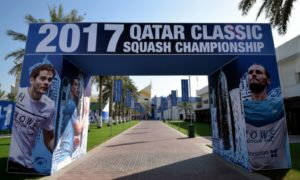 The Qatar Classic is the second men’s World Series tournament out of seven this season and will see players battle for points on the PSA World Series Standings. 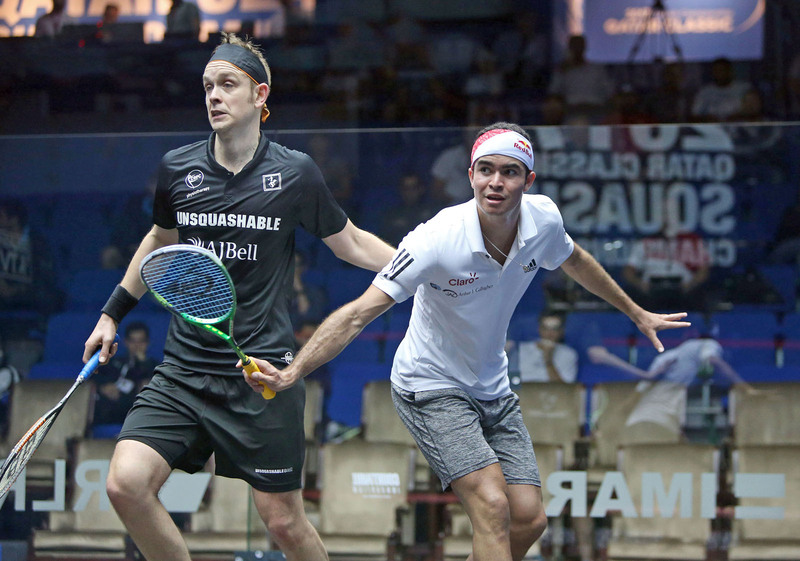 Egypt’s World No.5 Ali Farag currently tops the standings after his U.S. Open title in Philadelphia two weeks ago, with only the top eight players at the end of the season qualifying for June’s PSA Dubai World Series Finals. The Khalifa International Tennis and Squash Complex will host all of the qualifying fixtures, between October 27-28, and the main draw matches, which will be held between October 29 - November 3. Every main draw match will be shown live on SQUASHTV (rest of world) and Eurosport Player (Europe only), while action from the semi-finals and final will be shown live on mainstream broadcast channels around the world, including BT Sport, beIN Sports, Fox Sports Australia and Astro. Entry to the tournament is free of charge up to the semi-finals and final. Semi-final tickets are priced at QAR 20 for back wall tickets and QAR 15 for side wall seats. For the final, ticket prices are QAR 30 for back wall seating and QAR 20 for side wall seats. Tickets can be purchased at the kiosk in front of the spectator gate on both days. 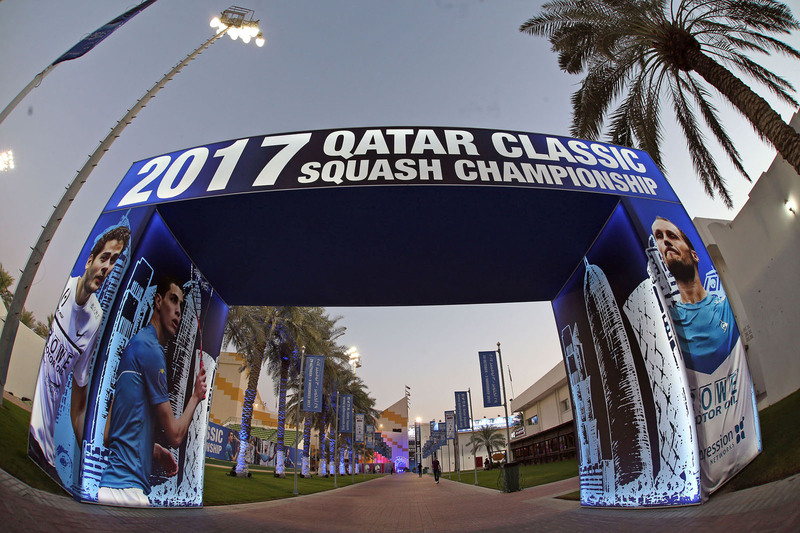 The 2017 Qatar Classic, PSA World Series tournament begins in Doha between October 29 – November 3 as the battle for points for the men’s PSA World Series Standings resumes, with only the top eight players qualifying for a spot at the season-ending PSA World Series Finals. The Qatar Classic is the second men’s World Series tournament of the 2017/18 season and is headed up by World No.1 Gregory Gaultier, who is seeded to meet two-time winner Mohamed ElShorbagy in the semi-finals. 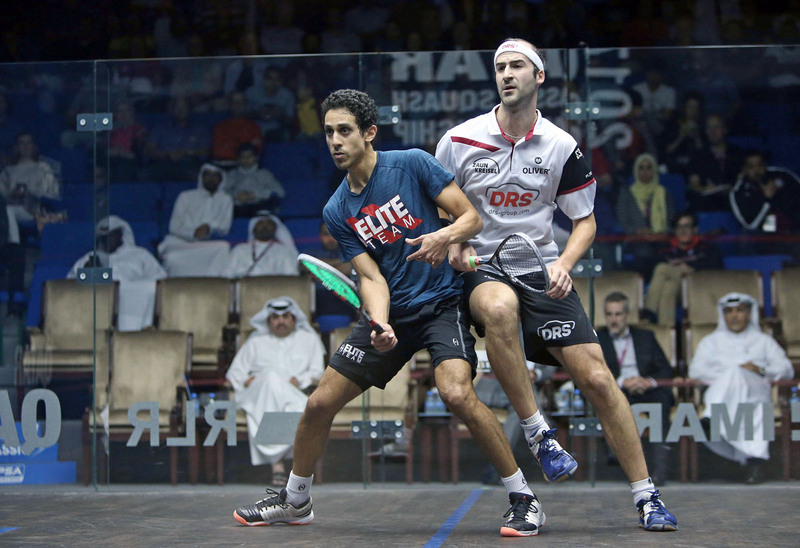 Defending champion Karim Abdel Gawad returns to the scene of his maiden World Series title victory, while the likes of 2009 winner Nick Matthew and U.S. Open champion Ali Farag – who tops the men’s World Series Standings – are also involved. European-based subscribers can tune into Eurosport Player to watch the action unfold, while viewers in the rest of the world can log into SQUASHTV.